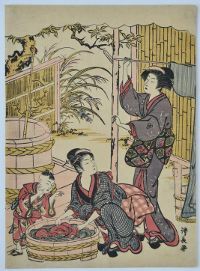 A chuban print showing a woman at a washtub watched by a small child. Another woman is hanging a kimono out to dry. Without any series title but with a scalloped cloud above which may have been intended to have a title. Published c. late 1770s. 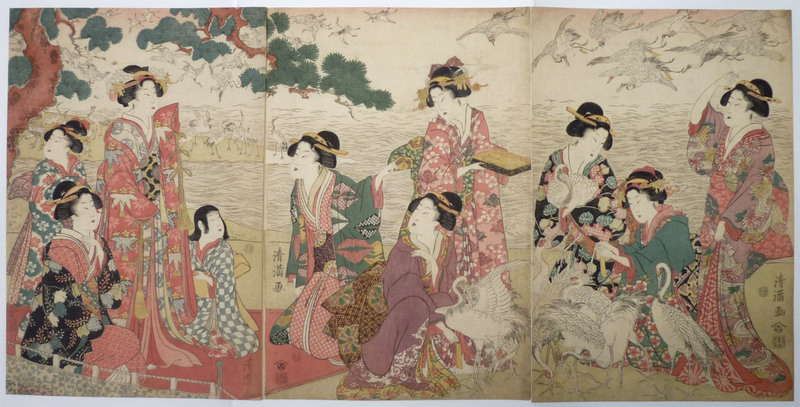 Rare: Not listed in Hirano, Chie Hirano, Kiyonaga, MFAB, 1939. Superb impression, colour and condition. Possibly a proof impression. 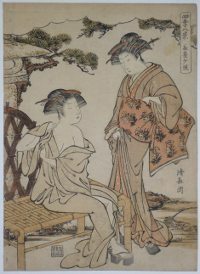 Signed Kiyonaga ga.
A fine actor design from a series of at least 31 such degatari prints ( showing singing or chanting at a theatre ). A scene from Shosa Hatsuhige yakko tanzen, played at the Ichimura-za theatre, November 1783. 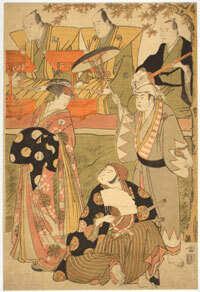 Shows Nakamura Nakazo as Tanzen seated with fan looking at Onoe Matsusuke as a young lady ( in reality a white fox ). To the right Ichimura Uzaemon as a yakko. The chanters Tomimoto Buzen-dayu and Tomimoto Itsuki-dayu at the back accompanied by Namizaki Tokuji. Published by Nishimura 1783. 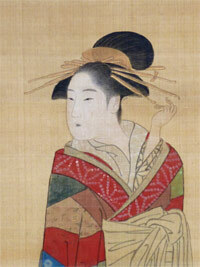 See Hirano, Kiyonaga, Museum of Fine Arts, Boston, no. 544, pl. LXXX. Very good impression and colour. Slight soil, otherwise very good condition. Full size. Signed Kiyonaga ga.
A chubby red Kintaro acting as an umpire for two battling tengu. Other tengu in baskets behind him and at his side a bear also watches. These tengu – winged, beaked and clawed creatures – lived in the mountains and forests. 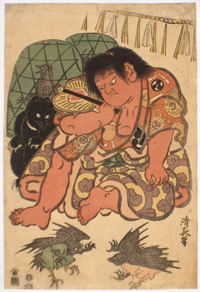 It is narrated that as a toddler he was observed shaking and tearing at a large tree in which there was a nest of tengu fledglings, which he took home in a basket. 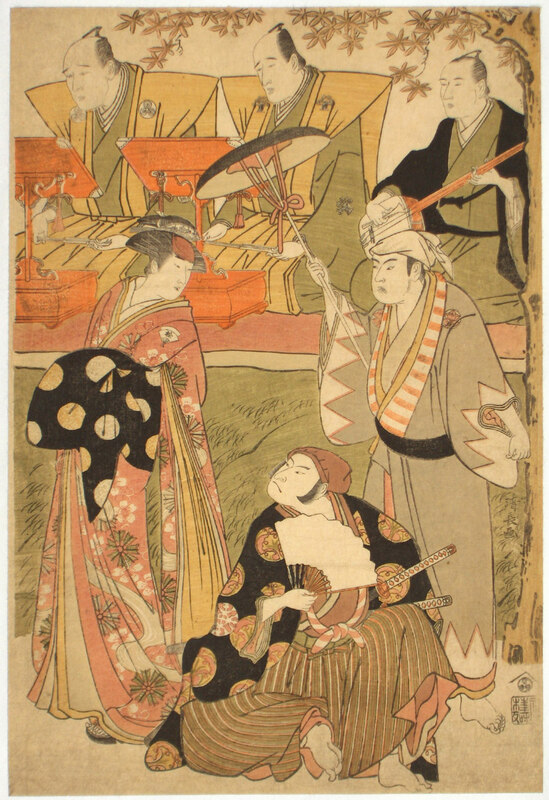 Kiyonaga designed at least 28 of these Kintaro prints, see Kiyonaga, Chie Hirano, Museum of Fine Arts, Boston, 1939, nos. 979 – 1006 ( this being 1005, PLLXV ). Published by Nishimura, 1812. Rare. Very good impression and colour. Minor edge soil and signs of mounting au verso. Signed Kiyonaga hitsu. Fine impression. Some “turning” of colours, otherwise very good condition. 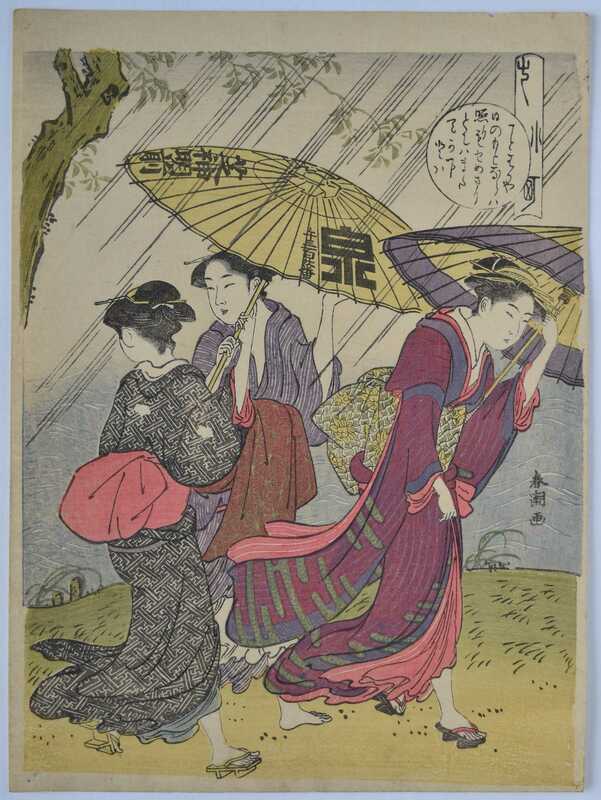 Signed Kiyonaga ga.
A chuban print showing a group of beauties caught in a downpour on the banks of a river. 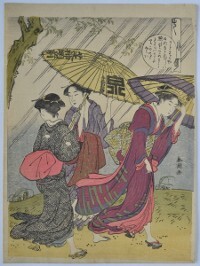 The centre figure has an umbrella with the publisher’s name Izumi [ya Ichibei] and address Shiba Jinmeimae which was in front of Shiba Daijingu Shrine. One of a set Nana Komachi, “The Seven Komachi,” being episodes in the life of the famous waka poetess Ono no Komachi (c. 825-c. 900). Little is known of Shuncho’s life except that he was a pupil of Katsukawa Shunsho and was then heavily influenced by Kiyonaga. He produced some particularly fine triptychs and pillar prints. Published c. early 1790s. Superb impression, colour and condition: As the day it was printed. 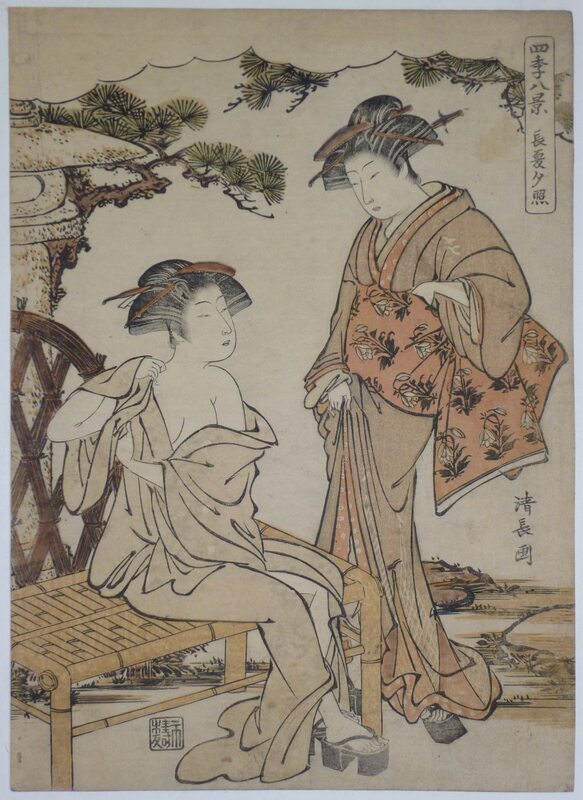 Signed Shuncho ga.
An original painting showing a standing beauty inserting a hairpin. An important print artist who produced many fine diptychs and triptychs. Paintings by him are rare. Studied under Shunsho, then Kiyonaga and Shumman. Full colour on silk, 30.75 x 10.5 in; 78 x 26.5 cms. Signed Shien Shuncho with unread seals. Beauties on the beach at Kamakura with white cranes. This is an allusion or pastiche ( mitate ) of the story that Minamoto Yoritomo’s favourite amusement was flying cranes with labels attached to their legs requesting those who saw them to report the fact and fly them again. Kiyomine, a pupil of Kiyonaga, used – as here – the Kiyomine signature on his early work, c 1815. 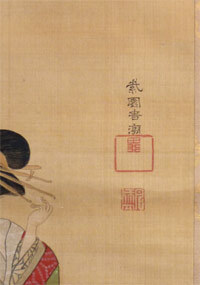 Published by Eijudo han ( Nishimura-ya ). Very good impression and colour. Small area repaired wormage, otherwise very good condition. Signed Kiyomine ga.